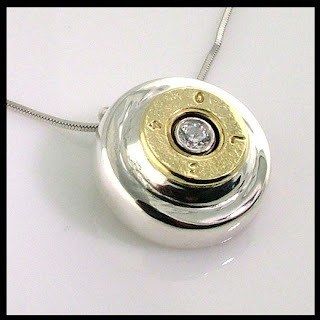 Custom jewelry should tell a story – like this military bullet casing pendant made by Scott’s Custom Jewelers. Recently, Janis came to us with a bullet casing from her father’s military funeral. He was a veteran and had died several months ago. After the ceremony, the funeral director presented the family with the bullet casings from the 21 gun salute. Well, Janis loves jewelry, but wasn’t too keen on wearing a bullet around her neck like a rapper. Wrong message. This had to be symbolic, yet not “in your face”. So she came to us with the casing and a great sketch of what she wanted the pendant to look like when done. She worked with Scott, telling him that she wanted it to be feminine, but bold. Simple enough to wear with jeans, but still dressy enough for an evening out. She wanted people to notice it so she could tell them about her dad. Lucky for her, Scott knew a little about bullets (he worked at a gun range while in college). He was able to design a sterling silver bezel using CAD (computer aided design) technology that fit the bullet just right. So he cut the end off, and fastened it using “jewelry magic” Then, to make it sparkle, Scott added a small white crystal in the center. He purposely left the bullet casing rough to show that it had been used. That roughness, with the contrast of the polished silver and sparkly gem, made for a very interesting piece of custom jewelry. Janis was overjoyed. She not only had a new piece of custom jewelry, but one with a great story!